Six astronauts risk their lives when dangerous events threaten their mission to explore one of Jupiter’s moons. Dr. Samantha Unger, CEO of Europa Ventures and Lead Mission Planner, recounts the disastrous journey of the Europa One spacecraft. Sent to Jupiter’s fourth largest moon on a scientific expedition, the Europa One never returned. Footage transmitted from cameras on their ship tells the crew’s story. Six crewmembers are aboard the Europa One. Dun “William” Xu is the Captain and Mission Commander. Daniel Luxembourg is the Chief Science Officer. Katya Petrovna is a Science Officer. Andrei Blok is Chief Engineer. James Corrigan is an Engineer. Rosa Dasque is the Pilot and Archivist. James records a home video for his family back on Earth. A solar storm damages key systems including communications. Andrei and Daniel conduct a spacewalk to investigate and repair the external damage. Andrei rips his glove and begins losing air. James uses his tether to bring Andrei back to the airlock. Unfortunately, James cannot go inside because his suit exterior has been contaminated. Andrei tries to rescue James by pulling him from his suit, but Andrei begins to black out. James instead forces Andrei into the airlock and then drifts out to space where he dies. James’ death hits the crew hard. After entering Jupiter’s orbit, a thermal vent from the planet’s surface buckles the ship and forces an emergency landing 100 meters away from their target location. The crew makes adjustments so that they can begin remotely collecting samples from the water below the icy surface. Andrei believes he sees a light flashing on the surface outside their craft. Katya conducts a surface walk to collect samples firsthand, despite the radiation risk. She collects an algae sample proving the existence of life on Europa. An iridescence in the distance draws Katya’s attention and she moves out of contact with the ship. Katya falls into the water and is lost. The crew prepares for liftoff from Europa, but the launch is unsuccessful. Daniel releases his restraints to blow the water shielding. The move saves the crew, but William dies from the impact when they crash land back to the surface. Dangerously exposed to radiation without the water shield and losing heat and oxygen, the remaining crew must fix the fuel line for another launch attempt. Rosa preps the engines from inside while Daniel and Andrei go outside to conduct repairs. Daniel and Andrei are both lost beneath the ice. As her last living act, Rosa floods the craft and the camera shows a luminescent tentacled creature entering the ship in the water. I imagine that a years long journey through the empty blackness of space with the same handful of people in a module no bigger than a studio apartment might be a rather dull experience. So is watching a movie depicting that voyage. In that regard, “Europa Report” successfully captures the crushing boredom that goes with being on a multi-year deep space science expedition. “Europa Report” is a “found footage” film that tells the tale of the Europa One spacecraft voyage in faux documentary form. Six astronauts are sent on a privately funded deep space mission to explore one of planet Jupiter’s moons. When the mission fails to go according to plan, the ill-fated crew is torn between decisions that may salvage their expedition or risk their lives. We know that the crew is ill-fated because the film begins after the mission has already failed. “Europa Report” uses a nonlinear structure that jumps back and forth and back again repeatedly. Sometimes the leaps are as much as months at a time, creating a story that pulls moments out of the mission’s timeline seemingly at random. This storytelling style makes sense for films such as “Memento,” “Pulp Fiction,” and “The Usual Suspects.” Those three movies gained something thematically from their backwards narratives whereas “Europa Report” earns no discernible advantage. Here it just creates a jumbled story. The movie starts with several minutes of footage without context. Astronauts flip switches, press buttons, and do the things that astronauts in movies usually do when seated at a command console. Within the first three minutes, one of the crewmembers is already dead and being mourned. After this flash forward, the film immediately flashes backward to when that crewmember was alive and well shooting a home movie and goofing about drinking each other’s filtered urine. Around the 18-minute mark, “Europa Report” then steps all the way back for formal introductions of the six-person crew with actual names and interview pieces. With exposition finally covered, Europa One lands on Jupiter’s moon. Crewmember James is back to being dead at this point in the mission. The movie remembers this fact after 10 or so minutes of watching the crew remotely set up equipment. Then the story suddenly jumps back to before entering Jupiter’s orbit when James was still alive. It is around this same time when the question dawns, are these scenes actually in the intended order? What the film gains from being disjointed is unknown. Of the six astronauts, James is the only person even remotely in possession of a personality. He is shown playing with family photos and cracking wise to keep the spirits high. Yet with all this being shown after he has died, there is no way to have any emotional investment in a loss that has already occurred. The rest of the crew has little to differentiate them from one another aside from gender and ethnicity. It is a cast as interchangeable as it is international. Character names could be swapped randomly anywhere in the script and no one would notice any difference in how the dialogue played. Exploring the vast unknowns of unconquered space should instill the thrill of discovery and the desire to marvel at one’s place in a complex universe. That sense of wonderment is quickly replaced by a hope that someone will confront danger in the form of an interplanetary threat or space creature and rescue the viewer from suffocating apathy. 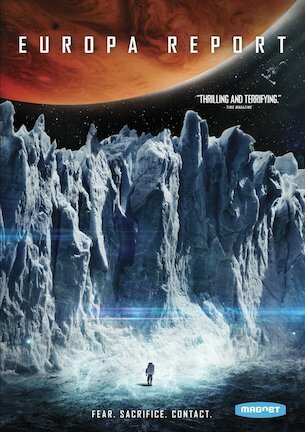 “Europa Report” looks terrific. The visuals are also complemented with a Bear McCreary score that screams “Battlestar Galactica” before his credit is even revealed. If anything, the music is conspicuously operatic for the presentation it is accenting. Unfortunately, that production value is fueling a story with very little legs. Thankfully, the audience only has to bear ninety minutes to take the journey that took the Europa One nearly two years. But that is still ninety minutes spent watching boosters separate after launch, crewmembers giving each other haircuts, engineers repairing equipment, and an astronaut searching for a lost toothbrush. And that is simply not worth the weak payoff waiting at the mission’s end. July 6, 2013 by Ian Sedensky.